- Break players into 4 teams. - Team A (Orange) starts by playing the ball to Team C (Yellow). Who in turn plays it to the next Team A Player. - Same for Team B and Team D.
- Each player must stay either in the channel, or on the line they are designated to. 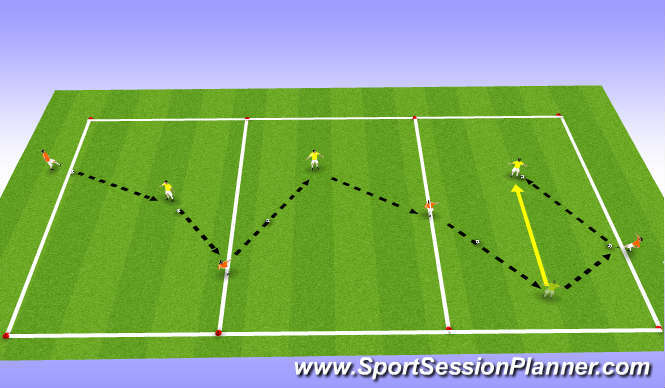 - Players should always be moving and creating angles for passing lanes. - Both Balls should be moving at the same time. - When you as the coach feel that play has become consistant, tell the teams to change the color of the team they are working with. - Really push them to figure this out quickly and get the pattern back into flow with minimal delay. 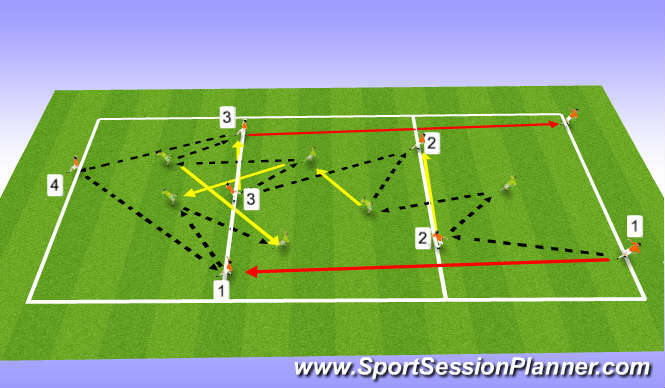 - The ball should be continuley moving from one side of the pitch to the other. - After you feel that they have grasped the concept and are executing to a high standard, & changing colors fluidly, time to move into movement. - But before you start having them change positions, change the passing pattern to a more direct and layoff penetrating pattern, rather then having the players open, let the pass be penetraing. - Shown above by Orange and Yellow. - When you are confortable with the success level, them to switch colors. Again, not allowing too much time for delay in recognition. - All four teams should be working simultaniously at this point. 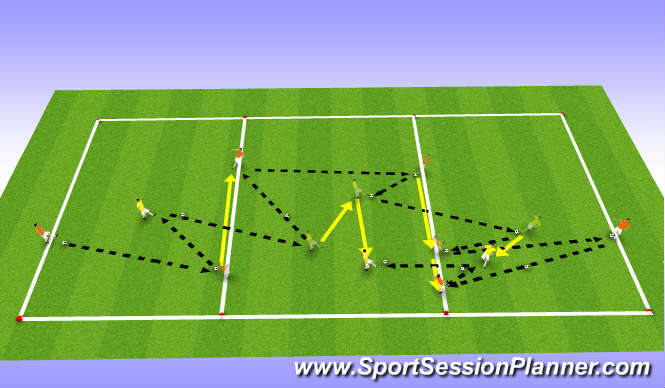 - This progression is about player movement, penetrating passes, and switching positions. - With the same passing pattern as Progression 2, now we want the channel players to switch positions based on where the ball is on the playing grid. - Simply, when the ball is released from the central player into the attacking third (based on which direction the ball is heading), have the defensive channel player switch with the central channel player to be the target for the 3rd (and turning defensive) channel player&apos;s pass. - Noted here by player 1, 2 and 3. - When you feel comfortable with the pattern change colors working together. Do not allow to much delay. 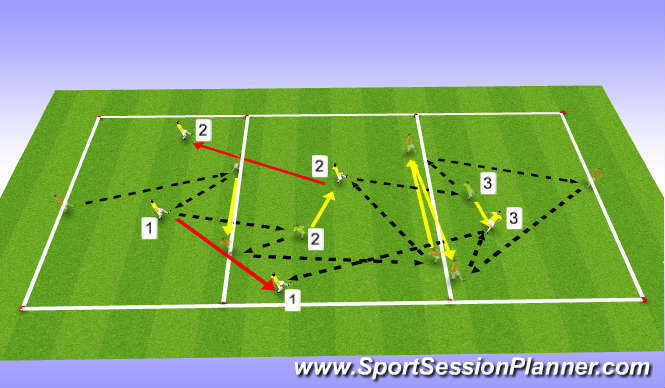 - 1 into 2; (after 2 plays alternate color the pass and then receives it from 2nd alternate color) 2 into 3; Then 1 and 2 switch in order for 1 to recieve the pass from 3 during the change of point of attack. - This phase will combine all of the movements, switching and penetrating passes that you have already introduced in progressions 1-3. But now you will add the final piece of movement, which is the switching of attacking line players. (or a team of 4, denoted by Orange players above). 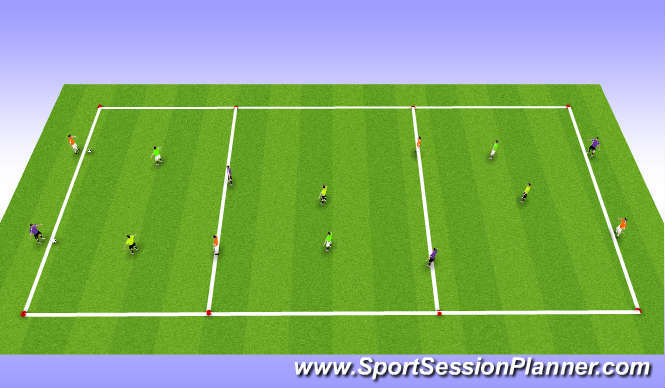 - When the final drop pass in made in the final third to the player 3, you will see player 1 come from the opposite side of the grid and receive the next penetrating pass on the point of attack switch. and player 3 will drop and take player 1&apos;s position on the far end line. - Make all of the prior movement is taking place between channel players as well. - At this point, each player in the grid will have a passing and moving responsibility. - When you are satisfied with the patterns, movement (ball and player), and communication, SWITCH COLORS! Don&apos;t allow time for delay.